Swirling Away (A short story) | My "Male Side" To Gender Issues. Member of the National Coalition For Men (NCFM.org/ncfm-home/) Since 1985. What could shock you more than knowing you were going to die in just a few seconds? “Happy Birthday, Megan,” Navigator Kasey Abernathy said too low to be heard. The near-constant ache in her chest throbbed harder than usual today, threatening to double her over. Megan, her daughter, would have been nine. Abernathy stood in her mag boots inside The Raven’s weightlessness. She sucked on a black plastic tube of cold coffee. It had all the unforgiving flavor that might come from the bodily fluid squeezed out of an armadillo. For maybe the tenth time since reaching the test-run zone, she fingered her wide purple head-band. She’d slipped it on post-launch to keep her brown shoulder-length hair — a length that snubbed company rules — from floating around into her eyes. She tried to empty her mind as she padded across the ship’s silvery titanium deck in less-than-graceful footfalls. With each step she took, from the control room’s food-server niche back to her nav-station, the sharp, metallic new-welding smell invaded her nostrils. When would she get used to it? The Raven was a 100-passenger, Earth-Mars shuttle fresh off the Mars City assembly line. She and test pilot Toby Lewis were putting it through the paces for their employer Creighton Astroline. Abernathy’s throat thickened. She fought back the sting of tears. Megan had died at her hand. Abernathy had been too hurried to reboot her vehicle’s unresponsive guidance system. Unaccustomed to doing her own driving, she had started a turn a split-second too late on a curve one mile from their North Carolina home. The vehicle bounce-rolled down an embankment. It smashed sideways into the massive trunk of a huge oak tree at the bottom. Abernathy incurred a broken left shoulder and severe strains. Little Megan had been crushed under the car roof. 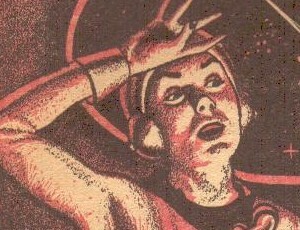 As a tribute to her daughter, Abernathy had cajoled the Raven’s programmers, an agreeable if harried bunch, into reconfiguring the shuttle’s computer system to respond to “Megan” and speak in Megan’s voice. The programmers completed the task after confecting a database of words from Abernathy’s voluminous audio and video recordings of Megan. A voice mimic/synthesizer would fill in the words Megan had never spoken. Abernathy would be able to close her eyes and picture her daughter standing in front of her. She soon realized, though, this hadn’t been the wisest thing to do. She heard Megan’s voice for the first time during the pre-flight check. It didn’t fill her with the anticipated joy as much as torture her, worsening her guilt and depression. Her throat constricted. Swiping at the wetness in her eyes with her fingers, she wished to God this test-flight would hurry up and end. Pilot Toby Lewis was a 50-ish prickly sort. He’d scoffed at the ship’s “Meganized” computer. As she strapped herself in, he didn’t turn his hard blue eyes her way. Instead, he tilted forward in his seat and froze. His forehead furrowed at the read-out tracking the ship’s speed. “Did you hear that?” Lewis glanced sidelong at her. His face showed no emotion except for a twitch in the pallid flesh below his eyes. Abernathy heard it. Faint at first, the noise quickly grew. A memory flashed before her eyes. When she was 11 years old, she often stood at the rusty cyclone fence surrounding a junkyard near her home. She watched the huge compacting press flatten old cars before they were hauled to a recycling center. That sound, the loud, brutal crunching of metal, was what she now heard echoing throughout the control room. “Shut the hell up, Megan!” the pilot said. “Don’t talk to my dau—” Abernathy checked herself, breathed in, let it drain. They hardly needed to be at each other’s throat. Metal groaned and screeched. The din rose to a near-deafening pitch. The control room began to vibrate under their feet. Black smoke drifted in, first in tendrils, then in billows all around them. The smell of burnt wiring and hydraulic fluid assailed their nostrils. In the overhead panels, a series of electrical sparking sent small globes of fire showering down over them, burning flesh where their flight suits gave no cover. Abernathy unbuckled and scrambled out of her seat. She crouched, clinging to the arm rest. She glanced about in the smoke-filling control room, trying to make sense of it all. No clues to the insanity were to be seen. And no escape route. “Megan! What is going on—!” Her voice choked off in the roiling smoke. In the smoke, Abernathy could still see his eyes darting from one instrument to another. A diagnostic monitor, level with his head, began to flicker as green data-feeds rolled up. Then in a spasm of blinking and fluttering, the monitor went black as coal. In one violent motion, the ceiling of the control room shuddered and dropped 12 inches. The floor swept upward. It hurled them against the lowered ceiling like rag dolls. Groaning against their bruises, they struggled in the weightlessness to position their feet and re-anchor themselves somewhere, anywhere, and gain control. Another violent spasm ripped through the shuttle. A huge, jagged, roughly triangular opening appeared in the hull near the control console. Abernathy glimpsed the blackness of space. The air and every object not secured to walls and consoles — papers, laptops, remnants of recently eaten meals — cannon-balled through the opening. Abernathy and Lewis, their arms flailing and grabbing, followed as if flung by a catapult. A sharp ragged edge of the bulkhead breach sliced open Abernathy’s upper arm. The snag put her in a slow swirl. Like a bizarre ballerina, she plunged out into the void. The blood erupting from her arm encircled her. It froze so quickly that had she been in air, she would have heard the tinkling of wineglasses shattering. She screamed. She heard nothing. The saliva on her tongue boiled off. Not yet lifeless, she could see the receding Raven with each turn of her bloating body. It was as if she viewed the ship in a series of photographs. The shuttle had folded onto itself several times. A black and silver, beach-ball-sized clump, it belched streams of smoke. Abernathy had in effect been heaved in one second from the bottom of an ocean to its surface. The bends jack-hammered her joints. Without atmospheric pressure, the blood in her veins and arteries started boiling as she began to quick-freeze on the outside. In the seconds of living that remained, her lungs screamed for air and her body bucked against the agony. Yet Abernathy tried to focus on Mars, the sun, and the stars gently whirling around her. Their light came dim and blurred through her iced pupils. The near-absolute-zero cold at last dulled much of her pain. She felt an eerie relief, an almost euphoric calm. Swirling away toward Mars, she caught one last shocking sight. Perhaps one kilometer on the other side of the smoldering Raven — her experience in space helped her judge the distance — lay the answer to her ship’s self-destruction: the sun-lit underside of a motionless, city-sized alien craft. She saw on its the massive bow what appeared to be row upon row of huge turrets . The craft was pointed straight toward Earth.